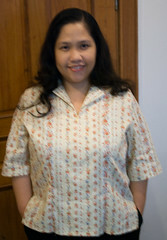 I’ve finished sewing a shirt for me. 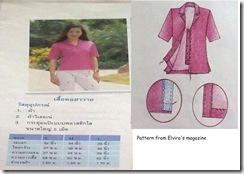 I started this shirt last week in the Elvira sewing course and continued it at home by myself. 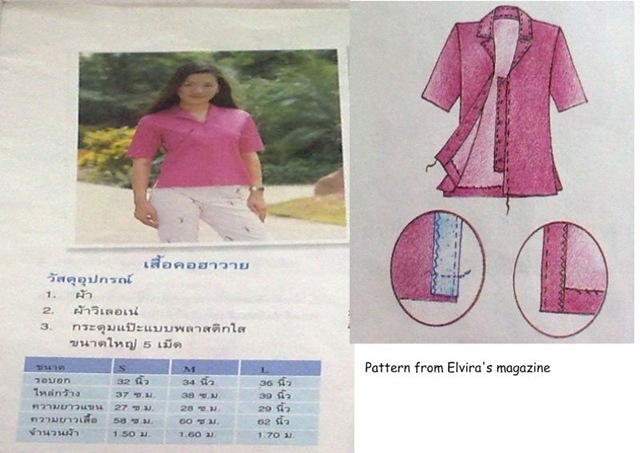 The original pattern (from an old magazine) was using buttons and doesn’t have any darts for shaping. Actually the pattern is not for my size. I asked my teacher to modify the pattern for me. In order to learn how to sew invisible zipper, I also asked the teacher to replace the buttons with invisible zipper. When I tried the shirt for the first time at home, it was way oversized for me. I am eager to modify it by myself, so… with some help from some review pages on google books, I tried to add the front and back darts for the shirt. Now, I have reasons to go for fabrics shopping. I want to practice making the pattern from the scratch instead of using some ready-to-use-but-not-for-my-size pattern :-).